The Norman 4700 Series Straight In-Line Filters with stainless steel housings designed for high pressures. 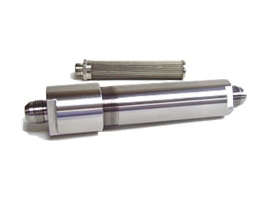 This filter is similar to our 43/4400 series but for operating pressures above 6,000 PSI. Medium pressure and high-pressure autoclave style connections. 4700 series are predominantly sold to aerospace and offshore oil & gas. Element collapse ratings of 3000, 3250 and 4500 psi are available. Our precision weaved stainless steel wire mesh elements are the ultimate in filtering media for industrial use. They provide size discrimination and freedom from media migration. Stainless steel elements are most suited to extreme temperature ranges and corrosive conditions. With proper cleaning, these elements can be reused for very long time periods. Glass fiber provides high dirt-holding capacity, high-efficiency (Beta5 = 200), low-cost and throw away convenience.